Jacksonville Foot & Laser’s Dr. Jeffrey Burmeister is the only North Florida Podiatrist selected as a Pin Pointe Laser specialist and provider. The patented PinPointe FootLaser is a specially designed laser beam that goes through the nail and safely reduces the infection in the nail bed that cause Onychomycosis — more commonly known as nail fungus. It is FDA cleared and backed by significant clinical research. The results are amazing and only one treatment is needed. The procedure requires a quick treatment with little or no discomfort and is performed as an outpatient service with no anesthesia. The gentle laser light beam has no effect on healthy tissue and treats only the infected area. No drugs or topical ointments are used, eliminating the total-body side effects of traditional oral medications. 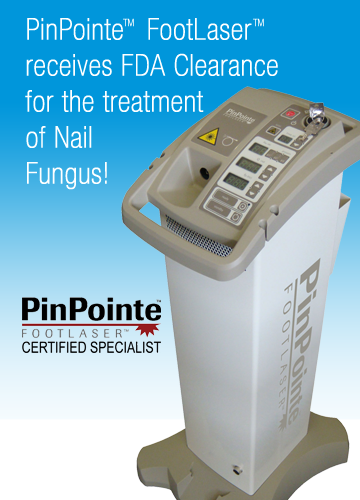 Clinical studies show that PinPointe FootLaser reduces fungal infection and promotes clear nail growth in most cases. PinPointe FootLaser is safe, effective and most patients improve after their first treatment.